We've talked about App Cloner before, and one of the problems we specifically noted was incompatibility with WhatsApp. Well, the update to 1.4.0 brings with it precisely that support, and that is a very good thing. If you happen to use multiple accounts for the service, for instance in the case of multiple SIMs, instead of having to go to the effort to manually switch (which can cause issues), now you can keep multiple instances installed and have each associated with its own account. Then there's no concern about missed notifications during periods not signed in on a specific account. It might be a bit niche, but that's a huge convenience. WhatsApp support isn't the only thing that's been updated. Prior to 1.4.0 apps like Chrome and Gmail would fail to work, but in the latest version they've been given some limited functionality when duplicated. The major caveat being that neither works directly with a Google account on duplicated installs, so email on duplicated Gmail will only be for external protocols like IMAP or Yahoo, and Chrome has no sync. A number of smaller but important changes are also included, such as cloning apps directly from APK without prior installation, marking cloned apps for update, individual settings for multiple clones, and new language options. 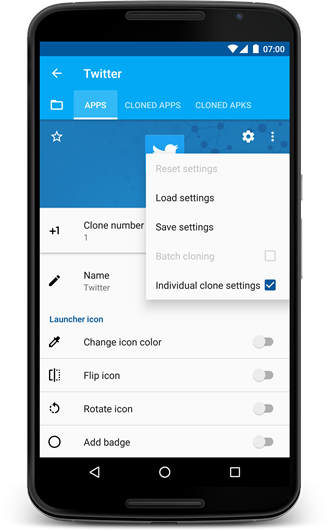 For those with a sense of humor, feel free to take the new update a step further and clone your App Cloner over at APK Mirror, dawg. Google rejected an icon pack for "content owned by a third party"